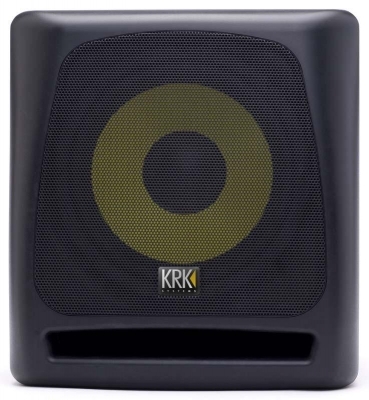 The KRK KRK10s is a 10-inch active powered subwoofer for studio monitoring, and is the perfect complement to KRK Rokit, VXT, or any other 4”-8” studio monitor. The KRK10s is designed to extend the low-frequency performance of an existing monitor system so that the low-frequency portion of the mix can be properly engineered. The KRK10s also feature a great looking cabinet that echoes the curved edges of the Rokit and VXT monitors. The front-firing bass port and KRK’s trademark yellow glass-aramid composite woofer ensure accurate and powerful low-end punch. A sturdy grill protects the woofer and adds to the sleek appearance of the unit. A high-power amplifier and active crossovers provide smooth and accurate reproduction. A New Standard in Low Frequency Monitoring. 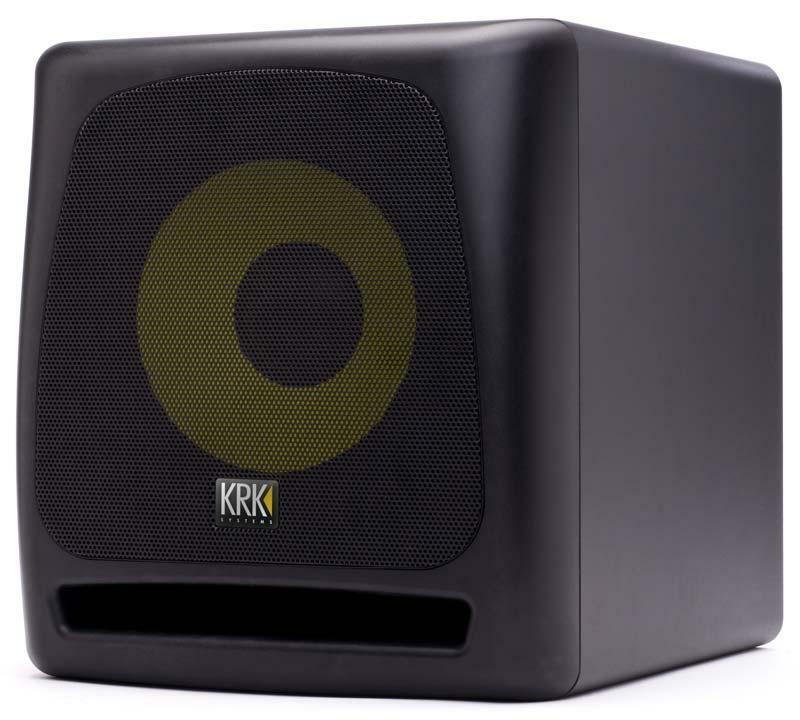 For years, KRK subwoofers have been the choice for accurate low frequency monitoring in studios large and small. Now, the KRK10s provides a new standard for even better performance and accuracy, raising the bar once again. Whether you are mixing in a 2.1 or 5.1 surround environment or just looking to upgrade the low-frequency extension of your existing monitors, the KRK10s will provide the low frequency detail and accuracy that will help you to create a better mix. Our new subwoofer series has radically curved surfaces for a great look and amazing performance. Finally there is a subwoofer that looks as cool as it sounds. You can even remove the grill to show off that beefy trademark yellow woofer. Take a look at competitive subwoofer monitors and you'll find ports on the back of the cabinet. These rear-firing ports tend to create bass coupling with walls and corners over-amplifying low frequency information which in turn colors your mix. The superior design of the KRK10s includes front-firing ports which are just the right shape to reduce port turbulence. You'll appreciate the clean and accurate bass performance this approach delivers, even at high SPLs. You need to feel the bass and our proprietary signature yellow woofer delivers tight, clear low end response. 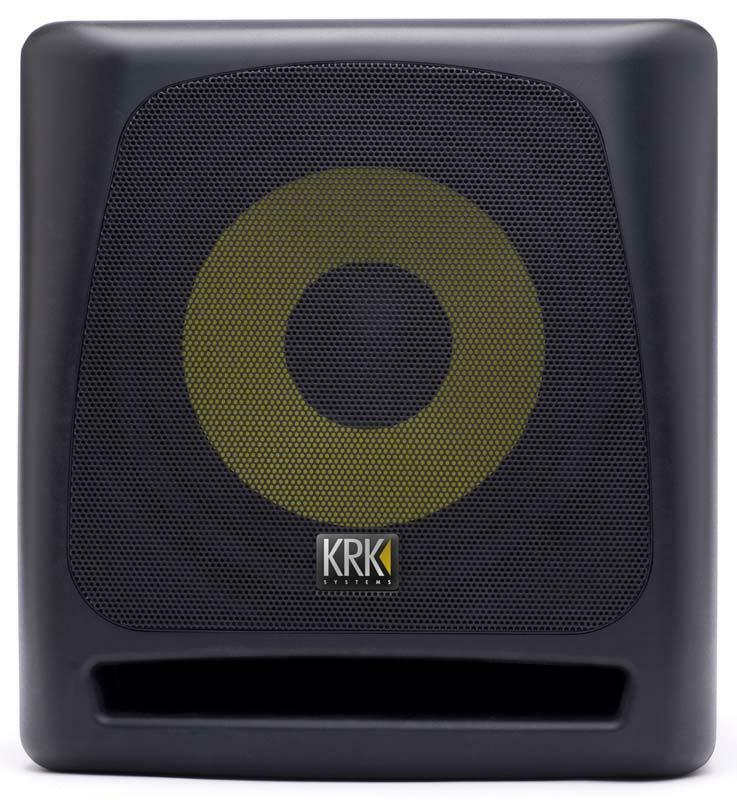 Our engineers and listening panel took the KRK10s speaker voicing to even more accurate levels. What you hear is what you are intended to hear, coloration is not part of the spec. This performance is brought to you by drivers that are custom-designed by our world-class studio monitor engineering team, for a clear, low-distortion performance. At KRK our focus is your mix. But it doesn't stop at creating accurate monitors. We live this stuff and appreciate the need for monitors that not only sound great but work easily with your particular set up. That's why you'll find plenty of input options with your KRK10s, sure to accommodate any studio environment. 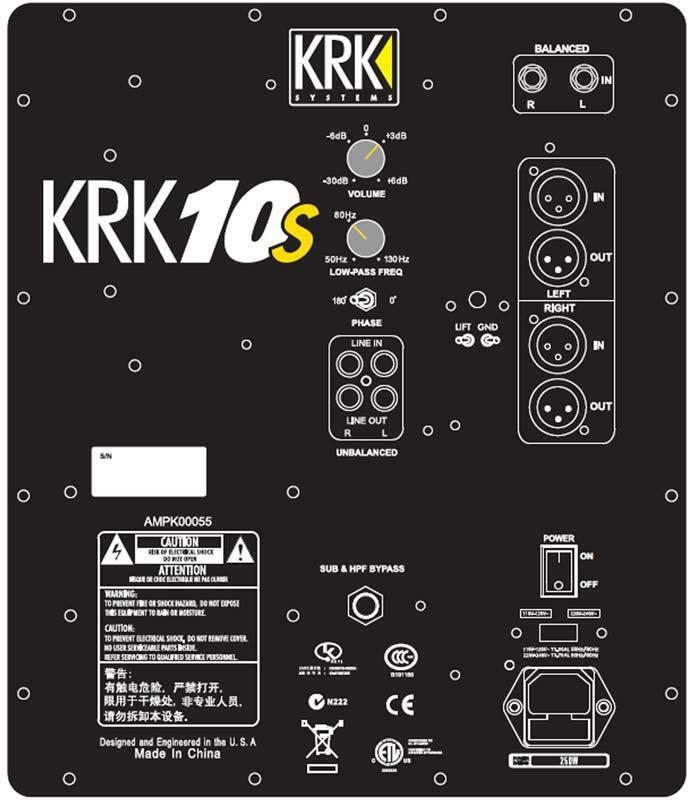 So if it's RCA, 1/4 inch (balanced/unbalanced) or XLR inputs you require, KRK10s has got you covered. With a sweepable 50Hz – 130Hz low pass filter, your KRK10s provides flexible control for any monitoring system. It’s true that we think your KRK10s sounds best using KRK full range monitors in a system configuration. However, the low pass filter provides great flexibility with any full-range monitor setup. Professional engineers like the ability to hear how the sub is affecting the mix. Plug in any standard latching 1/4 inch footswitch to bypass the KRK10s and send full range audio to your top monitors. A ground lift feature helps tame pesky ground humm. Your KRK subwoofer is equipped with a bypass feature which allows you to defeat the sub and provide full range audio to your recording monitors. You will need to use a standard 1/4 inch, mono, latching footswitch. Any standard latching 1/4 inch mono footswitch (such as the Boss FS-5L) should be compatible.